Get great discount on Sony CyberShot DSC-WX50 Point & Shoot Camera | Online India shopping best deals, discount,coupons,Free offers. This advanced CyberShot camera from Sony comes with a 25 mm wide angle Vario-Tessar lens that sports a focal length of 4.5 - 22.5 mm or a 35 mm equivalent of 25 - 125 mm. This Vario-Tessar lens comes with a 5x optical zoom capacity along with the further availability of a 20x digital zoom. The camera works through the highly capable Exmor R CMOS image sensor which gives the DSC-WX50 a remarkable optical sensor resolution of 16.2 megapixels. 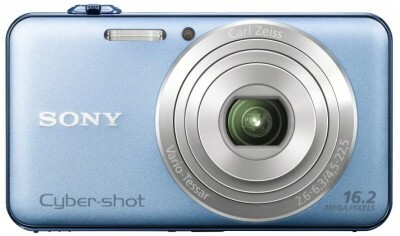 The DSC-WX50 sports a slim body which features Sony’s trademark CyberShot design and styling. With a combined weight of 117 g that includes battery and memory stick, this compact digital camera is highly portable and easy to carry around on all your travels. The advent of a powerful BIONZ imaging processor, this CyberShot camera has the ability to record full HD videos with 1920 x 1080 resolution at 60 fps. The presence of a stereo microphone makes it possible to capture stereo sound during video recording. All the captured images and videos can be viewed on the camera’s 2.7 inch Clear Photo TFT LCD display. This TFT LCD display with a brilliant display resolution of 460,800 dots also doubles as the camera’s live viewfinder. Battery and Storage Powered by a NP-BN rechargeable lithium-ion battery, this camera has the capacity to capture up to 230 shots on a single charge. The memory device on the camera can be accessed through a memory card slot that supports a wide variety of cards that includes Memory Stick Duo/ Pro Duo/ PRO HG Duo, Memory Stick Micro, SD, SDHC, SDXC, Micro SD and Micro SDHC memory card. This CyberShot camera works on a high-speed USB 2.0 digital interface which lets you transfer all the saved files on to a PC or a laptop. It also features a HDMI mini port that allows you to directly connect to an HDTV so you can instantly enjoy all your images and videos at its highest quality. Performance The aperture control lets you adjust the amount of light that passes through the lens of the camera, which on this CyberShot has an available range of f/2.6 - f/6.3. The autofocus function on this camera works using TTL or through the lens contrast detection technology and has a normal focussing range of 5cm (Wide) and 100cm (Tele) to Infinity. It also possesses a macro focus range of 5 cm that helps you with all your close-up shots. The ISO speed or the light sensitivity of the DSC-WX50 has a wide range of ISO 100 all the way up to a colossal ISO 12800. The variety of shutter speeds available on this camera has a highest of 1/1600 sec and a lowest of 4 sec. This CyberShot further increases its low light image capturing capability with a built-in flash unit that has an operational range of 20 cm - 5.3 m (Wide), 1.0 - 2.2 m (Tele) on auto ISO and 7.5 m (Wide) - 3.2 m (Tele) on ISO 3200. Features The Sony CyberShot camera comes with a variety of shooting modes and 6 white balance modes which give you a number of pre-set functions that are tailor-made to work perfectly in very specific situations or conditions. Employing the Optical SteadyShot image stabilizer, the DSC-WX50 lets you capture sharp and blur-free images. The built-in flash features Red Eye Reduction which helps capture clear and undisturbed images, irrespective of the available light. The face detection feature automatically finds, focuses and prioritises the clarity of up to 8 faces within the image frame with a special child and adult priority function. This along with a 2 or 10 second self-timer function gives the photographer a great deal of convenience for self-portraits and group shots. The DSC-WX50 is capable is shooting up to 10 fps on continuous mode which greatly helps while shooting fast moving objects..The product Sony CyberShot DSC-WX50 Point & Shoot Camera is from the famous brand Sony. The product is currently available with the amazing discount from FlipKart.Currently a discount of 2.0% available for this product. Great discount for this product which has the original price of Rs.8490.0 and you get these amazing products for a discounted price of Rs.8299.0. Hurry up. Stock may be limited.